Master Bathroom Maintenance This Spring With These Tips! With another frigid winter finally coming to an end, it’s only natural to start thinking about making big changes around the house, particularly bathroom maintenance. Spring-cleaning lets us tackle repairs, make some deep cleans, and get around to upgrades we’ve been too tired (or too cold!) to accomplish throughout the winter months. With so much new life blooming outside, it’s the perfect time to invest in a new start in our homes — even if it’s just for one room at a time. This March and April, while you’re scrubbing and mopping the bathroom, don’t forget to go a bit deeper and look to the room’s plumbing health! 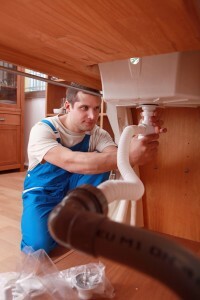 To start your bathroom maintenance, check your plumbing! A bathroom with faultless plumbing is only a scrub away from perfection, so be sure to follow our brief washroom inspection to get that spring-clean feeling. First, after cleaning the toilet, look for cracks in the bowl, tank, lid, or other parts. If you’ve got a small crack, it may not cause any problems now, but it could lead to bigger dilemmas down the line. This might be a perfect time to repair those nagging flushing issues you’ve been having — the handle that needs a few jiggles or needs to be held down just to get the toilet to flush. Replacing the handle or the interior components of the tank isn’t overly expensive, and can save you money on your water bill (and daily aggravation). You should also check to see if the holding tank is leaking water into the bowl. The easiest way to do this is to add a few drops of bright food coloring to the tank. If you see the water in the bowl change color in about half an hour, you’ve got a leak! Leaking tanks waste water and crank up your bills, so call our plumbing experts to have you airtight in no time. Once you’ve scrubbed the tub, why not take the time to clean the showerhead to have more powerful flow? Mineral deposits can really seal up the small holes, so to get them clear you’ve got to do some dissolving. Either take off the showerhead completely or attach a plastic bag filled with vinegar with a rubber band. You want the head to float in the vinegar overnight. Afterward, go at it with a toothbrush. If you don’t usually use the bathtub in question, pour a gallon of hot water down the drain to get things moving again. You can always snake the drain as a good start to a working relationship. After you’ve given your sink a wipe, look for more water-wasting leaks from the taps. You can catch a slow leak by placing a bowl under the faucet and checking for drops. A simple repair might be required — a replacement or greasing of the spring and seat of the stem. You could also unscrew the trap and empty the contents to find a blockage. Of course, if you don’t want to go to the trouble, we’d be happy to help! Check underneath the sink, too — check for moisture and mould. Then clean out your sink with a zip tool or snake, getting rid of accumulated debris. For both your bathtub and bathroom sink drains, we’d recommend investing in good strainers — they’ll catch excess soap, hair, and other substances that cause clogs. These are just a few basic, introductory tips, but don’t limit yourself to these or to a close look at the bathroom alone — your house’s plumbing is all part of a connected web, and if one part is slow or problematic, it can cause problems for every inch of the building. If you’d like some help with your spring-cleaning maintenance updates, simply give us a call and we’ll have a plumbing specialist help you through any job. Make this spring a real time of change, and let’s get to work!